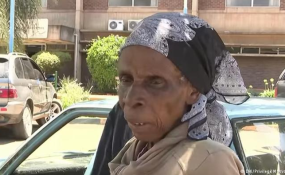 Cancer patient Violet Chimbiro can't get the medication she needs. The Government is dismayed by junior doctors' continuation of industrial action despite authorities meeting the majority of their demands. Government has met eight out of 10 initial demands made by the junior doctors, including a car import facility, but the latter remain adamant, demanding to be paid in United States dollars. They also want disciplinary action against striking doctors withdrawn, despite the fact that the strike has been declared illegal by the courts. Yesterday, Acting President Constantino Chiwenga said Government was gravely concerned about the junior doctors' withholding of labour and was taking steps to restore normalcy to the health service. "Following a series of meetings involving striking Health Workers and their employer, the Health Services Board, Government is gravely concerned that the situation in our country continues to deteriorate to the detriment of patients who need and deserve medical attention as a human right in line with our constitution," said Cde Chiwenga. "In particular, Government is disturbed by the fact that in spite of many concessions it made to the striking doctors, and the broad agreement reached on all but two issues, the striking Health Personnel continue to withhold their labour and negotiate in bad faith even though they are designated as an essential service under the Labour Act, and even though Government has bent over backwards to accommodate them," he said. Government was equally worried with some political overtones which the labour issue had assumed, Cde Chiwenga said. Government is now taking key steps to urgently explore other ways of ensuring that this essential health service is stabilized in the interim while more lasting measures are put in place to normalise the situation. "Government will be making further announcements in the coming days," promised Cde Chiwenga. Other measures include continuing to import essential medicines and accessories vital to health service delivery and fulfilling all the commitments Government has made to all health workers and undertaking to review the conditions for all workers in the Public Sector within the second quarter of this year consistent with the budget cycle. In line with the Court Order that declared the strike unlawful, Government will request the Health Services Board to take appropriate action against the striking doctors.